Some women who monitor their appearance and condition of hands, manicure is not in salons and at home. Quite a fashionable decoration for your nails are glitter. When applying them on the gel are faced with some little difficulty, when they are unevenly distributed and collected in clumps. This can be avoided if you do a manicure properly. There are several ways to create nail Polish using glitter. First, you can mix the glitter with a small amount of gel before applying. Treat your nails and prepare them to create a manicure. Apply to all five fingers of the left hand small amount of bonder gel. After treatment, the nail must appear to be matte, shiny, or if it seems wet, remove excess bonder gel with a sponge. Wait until the gel dries, and do not remove the sticky layer after that. Then apply a clear gel in a thin layer on the entire surface of the nail plates of each finger. Try to keep the tool from falling on the skin around the nail and cuticles, otherwise the varnish will flake or peel off. After drying the gel, do not remove sticky layer. 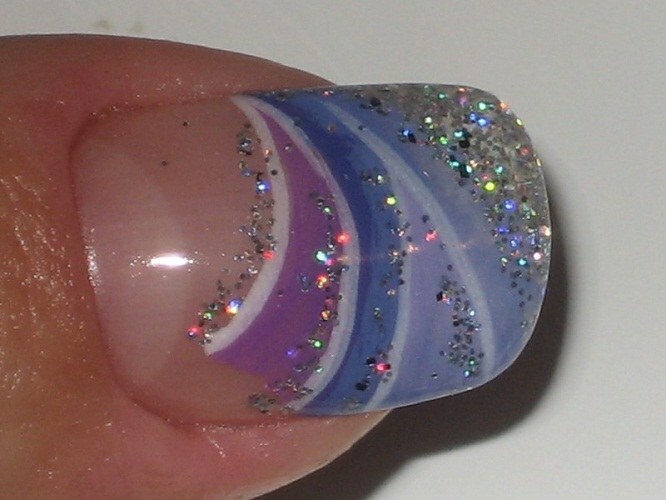 Mix a small amount of gel with glitter and a thin layer spread on the surface of the nail. After drying, remove sticky layer with a sponge. Some experts recommend to do makeup with glitter in other ways. To begin, apply to the nails base coat and after it dries and simulation. After it dries, apply a small amount of clear gel and glitter. Remove excess, dry your nails and file his nails. Apply the top layer of gloss and your manicure is ready. In order to reduce the consumption of sequins, you can purchase them a separate brush, which will prevent glitter in the gel after use and will save you from having to constantly clean the brush. Some experts recommend to put nail sequins on top, and not to apply them on the gel and not mixed with it beforehand. To do this, take the usual applicator for eye shadow application brush, or a plastic tube for a cocktail, cut at an angle, enter a small amount of glitter and sprinkle over the nail with the applied gel. Using this method, it is very easy to control the amount of glitter and the scope of their application.